Consider the information about Royal Air Force Museum that boasts some of the most enormous expositions in the world. Read about its opening hours, admission and location. 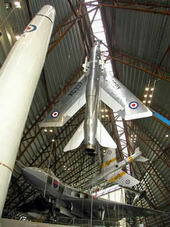 Known as 'The Aerospace Museum, Cosford' but now re-titled to emphasize it's RAF heritage. It boasts over 80 aircraft exhibits, the museum is home to four major collections - British research and development aircraft, transport aircraft, warplanes and missiles. The museum has also a large collection of aero-engines and other aviation-related displays. Art and Picture Galleries regularly stage exhibitions of aviation-related art and the restoration centre houses exhibits from the reserve collection formerly at RAF Wyton. On 8 February 2007 the new 'National Cold War Exhibition' hall was opened. Daily 10am to 6pm except December 24-26,31 and January 1. The last entry is at 4pm. All admission is now free. Amenities are Heated Exhibition Hangars, Souvenir shop, Restaurant, Picnic Area, Toilets, Free Car Parking, Facilities for Disabled Visitors.